The Hustler’s accomplishments over the last year underlines once again just how critical the C-2 Greyhound and its Carrier Onboard Delivery mission is when it comes to projecting and sustaining U.S. Naval power abroad. This is especially relevant considering the Pentagon’s pivot toward the vast Pacific and heightening regional tensions over maritime claims in the region. Controversially, the C-2 will be replaced by the HV-22 Osprey in the not so distant future. 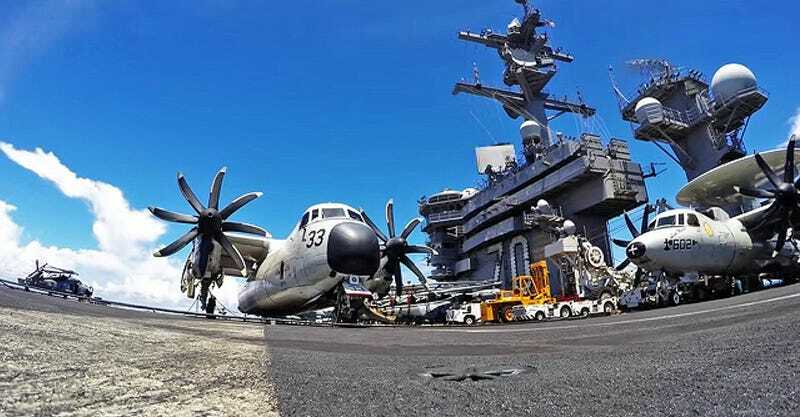 Although there are some benefits to using the tilt-rotor for this mission, such as the ability to provide point-to-point resupply of other ships in the Carrier Strike Group, it also has massive drawbacks, some of which could present strategic vulnerabilities to American flotillas. Regardless of the changes to come, here’s to you, the hard working men and women of Detachment One and VRC-30, who do so much with comparatively little. And just remember folks, that at any given time, there is at least one VRC-30 detachment out there somewhere around the world, supplying our water-borne armadas with the most essential people and material they need. It is a mission that truly never ends.